Since the first International Corporate Identity Group’s symposium in 1994, the fields of corporate identity, corporate communications and corporate branding have become a focal point for scholars and managers alike. Recently, the term corporate marketing has incorporated a host of key corporate-level concepts, representing a new paradigm of thought. 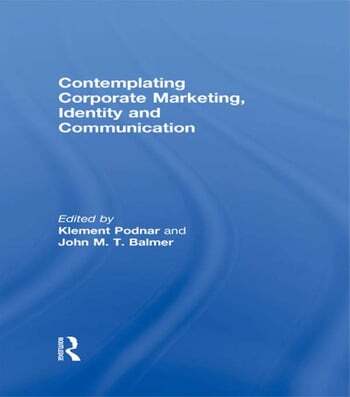 Contemplating Corporate Marketing, Identity and Communication is a collection of papers and extended abstracts from the 12th ICIG symposium, presenting a variety of perspectives with a view towards stimulating debate about the advances in corporate marketing, identity and communication. The contributions in this volume examine critically the development of the field and focus for future research in order to encourage cutting-edge scholarship along with practitioner insights. In a field characterized by paradoxes – unity and variety; integration and specialization – the aim is to integrate diverse practices to inspire a more sophisticated approach or theoretical framework. The papers in this volume are both challenging and distinctive. Klement Podnar is Head of Marketing Communication and Public Relations at the University of Ljubljana, Slovenia. He researches corporate identity, image and reputation, organizational identification, corporate communications and marketing and has published in numerous journals, including the Corporate Reputation Review and the Journal of Marketing Communications. John M. T. Balmer is Professor of Corporate Marketing at Brunel Business School, UK. His articles on the corporate identity, corporate branding and corporate marketing have been published in leading journals including the California Management Review, the European Journal of Marketing and the Journal of Business Ethics. He is Founder, Chairman and Conference Organiser of the International Corporate Identity Group (ICIG).